This year, Jake knew exactly what he wanted for his birthday. It was s’moresy. It had ice cream. It was a layer cake. 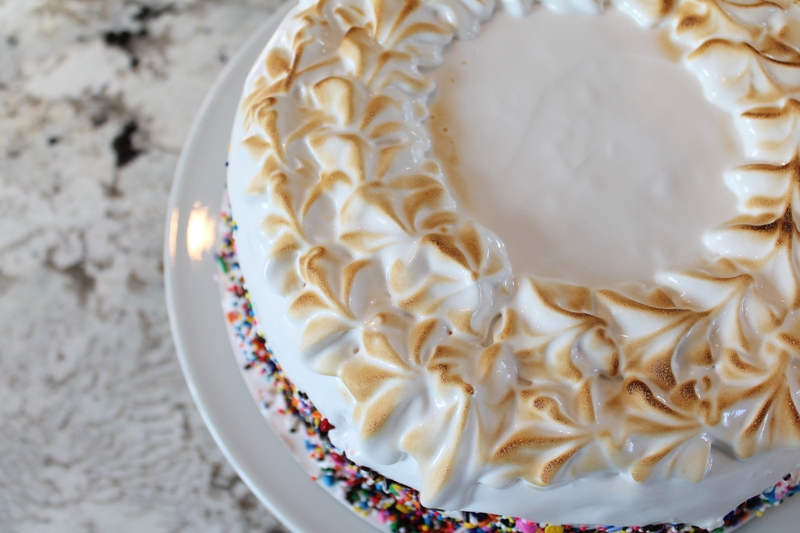 I had never made an ice cream cake before, but it turns out that it isn’t hard! Also, it turns out that Jake is once again a dessert genius, because this birthday cake was phenomenal! Before you start to panic about the amount of steps to make this cake happen, let’s just overview. This cake consists of three basic parts: graham cracker crusts, brownies, and marshmallow ice cream. I also frosted the outside of the cake with marshmallow frosting, which is basically homemade marshmallow fluff. All of the components are very simple, and you can do everything except the outer frosting several days in advance, working slowly if you like, because everything will keep in the freezer! I am an ice cream cake convert. 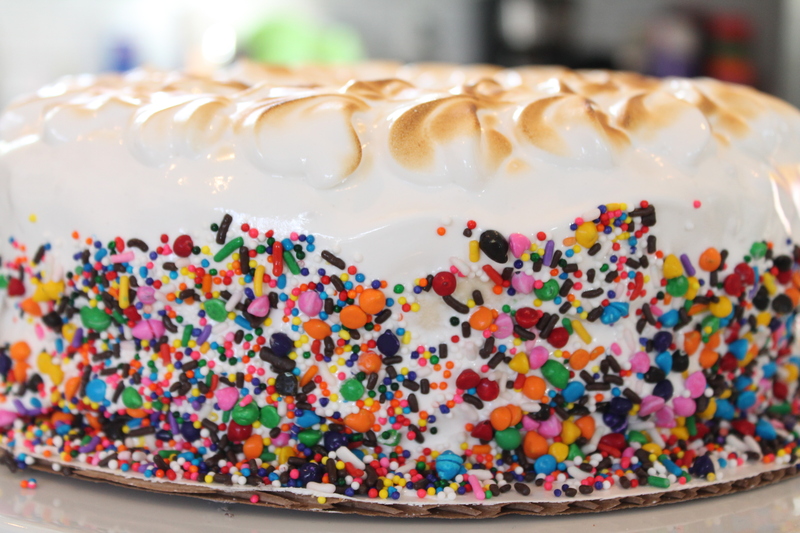 An ice cream cake starts, naturally, with ice cream. 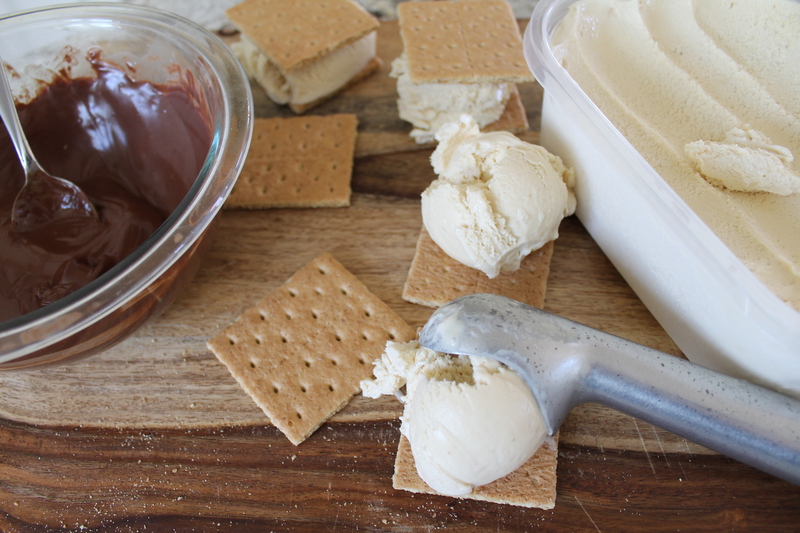 I made my own, from this recipe for toasted marshmallow ice cream. After churning the ice cream, instead of scraping it into an airtight container to freeze firmly so I would be able to scoop it later, I just lined a 9″ round cake pan with plastic wrap and scooped the ice cream straight out of my ice cream maker into the pan. This way, it froze in a beautiful, thick layer perfectly sized for the cake. Next, we make a simple graham crust. I used 3 cups of graham crumbs and 10 tbsp. melted, salted butter, and just stirred them together. Press about half of the moist graham mixture into a foil-lined 9″ round springform pan, or a cake pan with a removable bottom. Trust me, the removable bottom will come in handy later! Press the other half of the graham crust in an even layer right on top of the marshmallow ice cream. Make sure it is frozen well at this point, so it doesn’t squish around, and work quickly. Return the ice cream to the freezer. Now we make the most rich and delicious truffle brownies. Yum. I should post about these separately at some point, with more detailed photos, but for now…just beat eggs until frothy, then add sugar and vanilla and beat until thick. Melt bittersweet chocolate with butter in a microwaveable dish. Be careful not to overdo it, just heat until the butter melts and then stir until the chocolate is smooth! Stir the chocolate mixture into the eggs, and then stir in flour. These brownies are fudgy heaven. Scrape the batter into the lined pan right over top of the graham crust. Bake the brownies for 18 minutes at 350°. They should be soft in the center, but not soupy. When the brownies are cool, spoon a delicious ganache of melted chocolate and cream over top and spread until even. Freeze the brownies 1 hour. 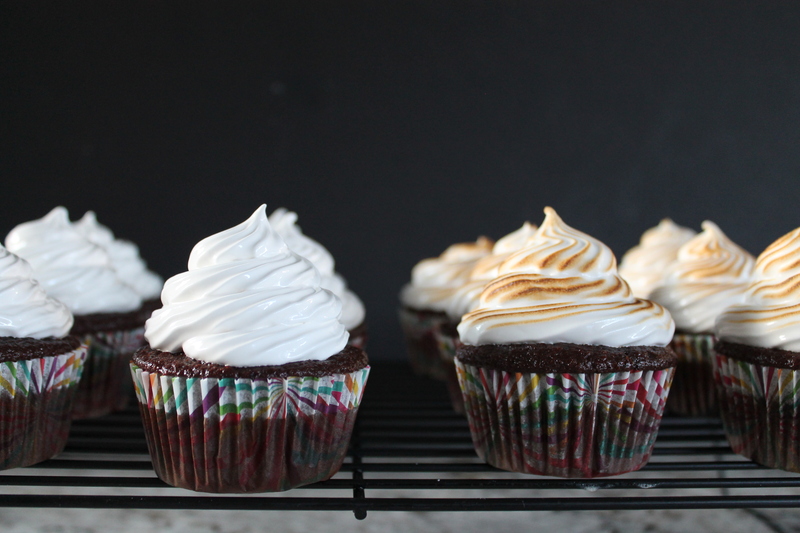 Before we assemble the cakes, we need to prepare our marshmallow frosting. 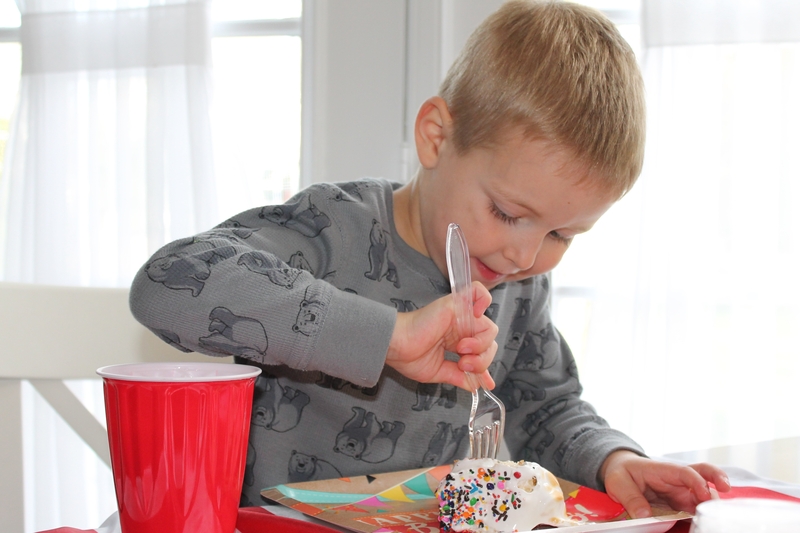 Feel free to skip this step if you want your cake unadorned, but my kid likes marshmallow and loves frosting. Plus we had to sprinkle the heck out of the cake to fit our Candyland party theme. So I made some seven-minute frosting, which is very simple! Simply combine two egg whites with sugar, water, a pinch of salt, and cream of tartar. Beat this with a hand mixer about 1 minute, until it is foamy. Then set the whole bowl over a pot of simmering water and beat with the hand mixer on high speed for 7 minutes. This will probably make your arm tired, from holding the mixer at a weird angle. Watch the clock. I promise by the end of seven minutes, you will have produced homemade marshmallow fluff that is thick and creamy! Beat in some vanilla and you are good to go. I recommend letting this cool completely before you try to frost your ice cream cake. For obvious reasons. And it never hurt anyone to beat it a little extra just before time to spread! And let me just advocate for toasting this frosting. Because that is amazing. I sent Jake to preschool with s’mores cupcakes for his birthday, and the best part of the whole deal was the toasted seven-minute marshmallow frosting. If you don’t have a brûlée torch, your frosting will still taste marshmallowy, but you are going to miss out on the most delicious smell of toasting and caramelizing. I am not actually a huge marshmallow fan, but once you brûlée this frosting, I am sold! Now comes the slightly challenging part: stacking the two layers. Pull the brownies out of the freezer first and release them from their pan. The graham crust should be baked firmly enough that you can peel the foil or parchment off the bottom without it crumbling. If the crust starts to crumble, keep calm! It’s okay for a few crumbs to run away. Quickly set the brownies, crust side down, on a 10″ cake circle. I usually like to glue my cakes to the cake circle with a little frosting so it won’t slide around while I work on it. After the brownie/graham layer is secure, pull the ice cream/graham layer out of the freezer. Peel the plastic wrap off and set the ice cream on top of the truffle brownies. Press down lightly to help them bind together. I will admit that, in retrospect, I wish I had put the graham side in the middle and the ice cream side on the top, because the ice cream softens more quickly than the frozen graham crust. This made the cake a little more challenging to cut (firm graham crust on top of thawing ice cream = smushing), even though it was truly a gigantic ice cream s’more with the grahams on the outsides. You decide what you want to do with it, and I’ll trust your judgment! Now frost that sucker! Just use a spatula, don’t get too fancy about it. Marshmallow frosting can be rather slippery, and it doesn’t have a lot to cling to with the frozen, slick ice cream inside this cake. If you like, you can take a fork or your fingers and pull the fluff into peaks on the top. I actually piped some stars on the top of the cake, and then I grabbed a brûlée torch and toasted the outside of the cake a little, which smelled divine! 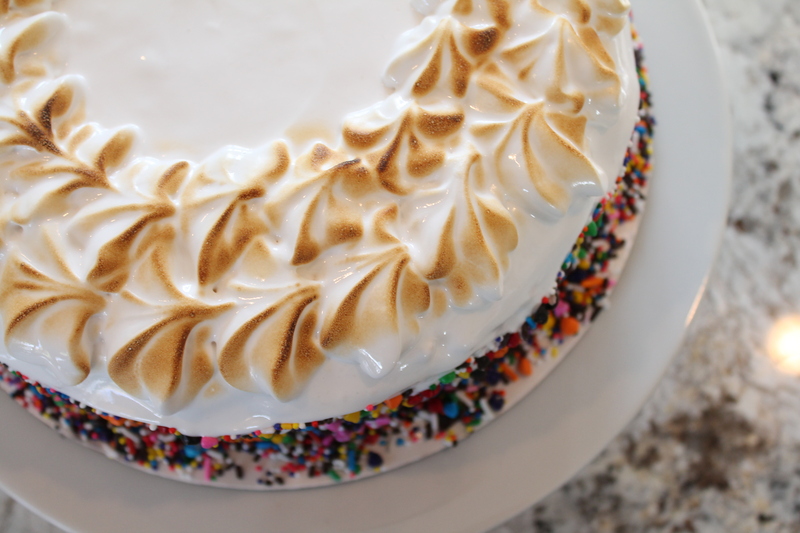 And…if you decide to coat the outside of the cake in sprinkles, just be warned that this frosting is soft and the sprinkles will start to slink down toward the base of the cake. It’s the sad truth. But even if that happens, the cake will still be stupendous and highly cute and very fitting for a brand-spanking-new 4-year-old! Or, really, anyone with a sweet tooth who loves the taste of summer. Start at least 24 hours before intending to serve. Heat the oven to 350°. 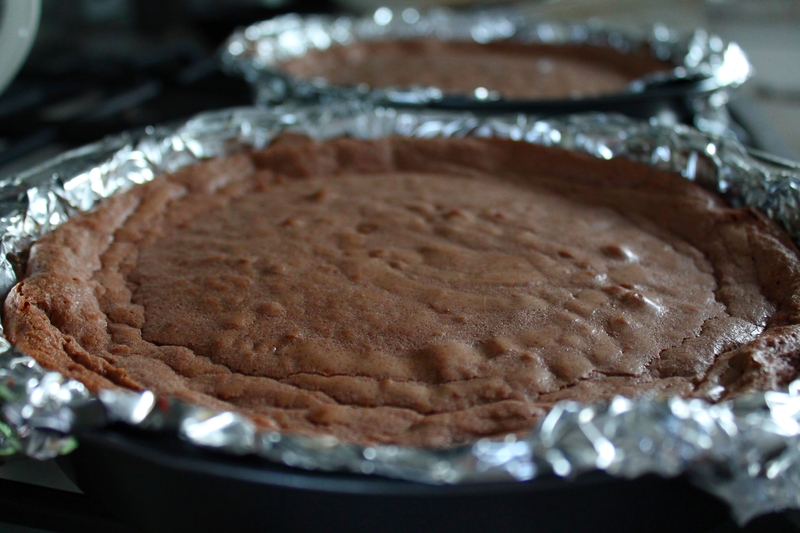 Line the bottom and sides of one 9″ round cake pan, ideally with a removable bottom, with foil. Spray the foil very lightly with oil. Line a second 9″ round cake pan with plastic wrap. Stir together the graham crumbs and melted butter. 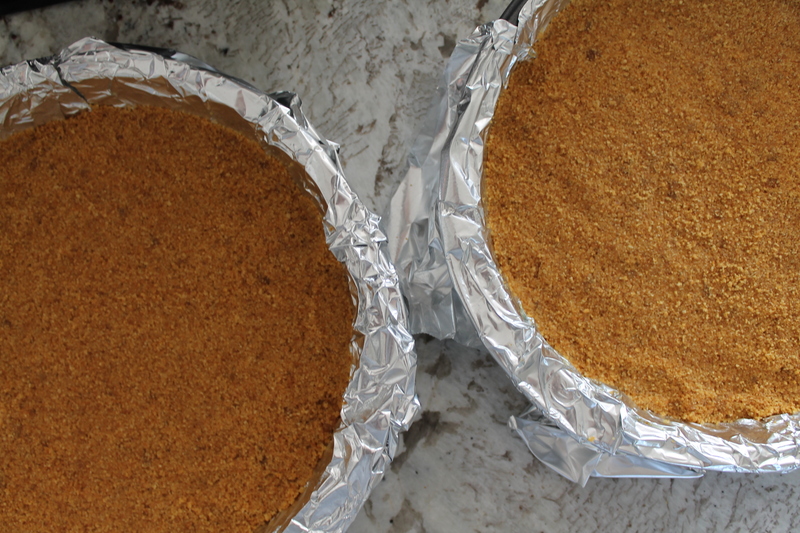 Firmly press half of the crumb mixture into the bottom of each of the lined pans. Set the crusts aside. In a mixer bowl, make the brownies. Beat the eggs and salt together until foamy. Add the sugar and beat again on high speed until thick and pale. Stir in the vanilla. In a microwave-safe bowl, combine the chopped bittersweet chocolate and the butter. Heat in the microwave for 1 minute, then whisk until completely smooth. 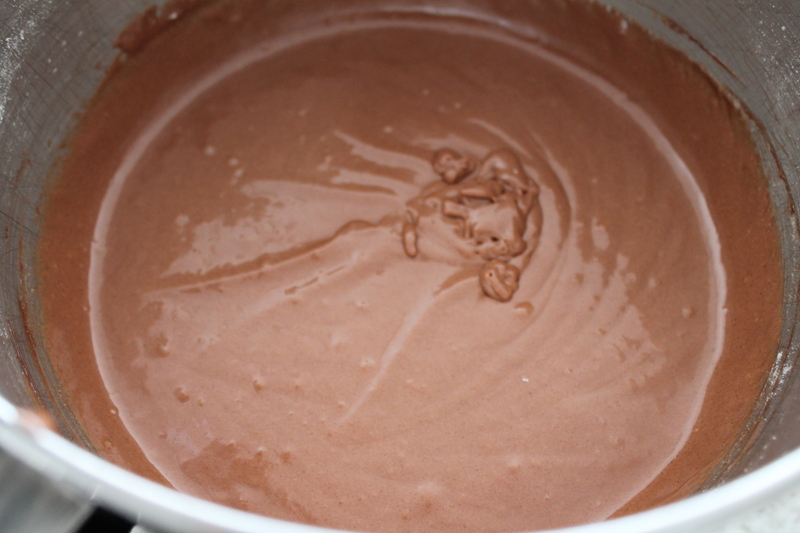 With the mixer running, pour the melted chocolate into the egg mixture. Scrape the bowl to ensure that all of the chocolate ends up in the batter. Add the flour to the batter and stir another 30 seconds. Spoon the batter into the foil-lined cake pan, spreading the batter until the top is even. Bake for 18–20 minutes, until just set in the center. Allow to cool completely. Meanwhile, prepare the ice cream batter and churn the ice cream. Scrape the churned ice cream into the second, plastic-lined cake pan, spreading the top until it is as flat as possible. Cover tightly with plastic wrap and freeze until firm, at least 3 hours. When the brownie layer is cool, warm the semisweet chocolate and cream in the microwave for 45 seconds. Whisk until smooth. Spread the ganache over the brownies. Place the brownies in the freezer until the ice cream is set and time to stack the layers. Before stacking the layers, prepare the marshmallow frosting. Set a small pan filled with 1″ water on the stove over medium heat. Bring to a simmer. Combine egg whites, sugar, water, salt, and cream of tartar in a large, glass bowl. Beat for 1 minute with a hand mixer. Place the bowl of egg whites over the simmering water and beat the egg whites for 7 minutes on high speed. At the end of 7 minutes, the whites should have formed a thick, opaque meringue that can hold its shape. Beat in the vanilla and allow the frosting to cool completely on the counter. This frosting will not keep well, so do not plan to make it ahead of time or it may become too soft and slightly grainy. When ready to stack the layers, spread a small amount of frosting on a 10″ cake circle. Carefully remove the brownie layer from its cake pan and peel off the foil. Set this layer, graham side down, on the cake circle. Remove the plastic wrap from the ice cream layer and invert it onto the brownie layer. Press down lightly to help the layers seal together. Frost the cake with the marshmallow frosting, working quickly so that the ice cream does not melt. If desired, toast the outside of the frosting with a small brûlée torch. Return the cake to the freezer for at least 1 hour so that everything sets together. 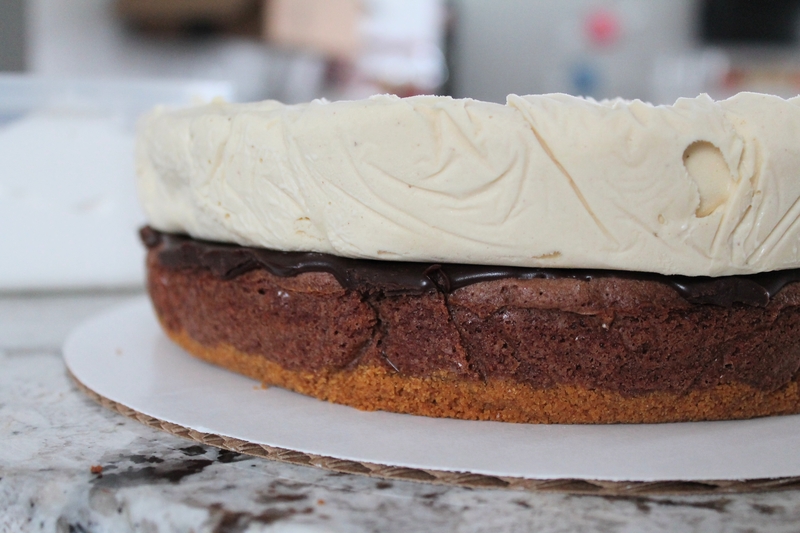 Twenty minutes before serving, remove the cake from the freezer to sit on the counter. (Alternatively, allow the cake to sit in the refrigerator for 1 hour before serving.) Cut with a very sharp, warm knife. 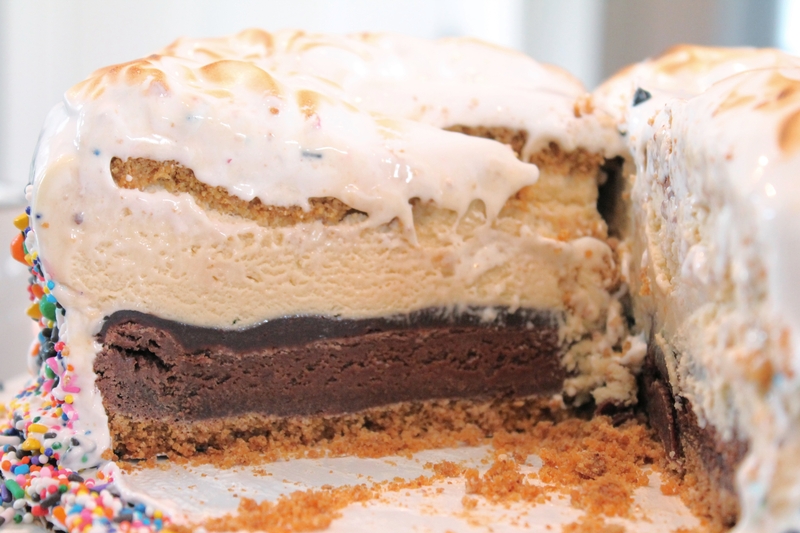 This is the most brilliant ice cream cake EVER! Yum!